Sprawling branches often root and form colonies. sometimes in open areas like clear cuts. Large growing native deciduous tree. Tolerant of wide range of conditions. Good for shade or garden specimen. Likes sun to part shade. ECOLOGY: Needs shade, likes acid soil. Prefers a cool, moist humous rich site. Showy white flowers spring, sweet black berries in summer, has good fall colours. ECOLOGY: Likes sun/part shade. Found in well-drained dry to moist soils. 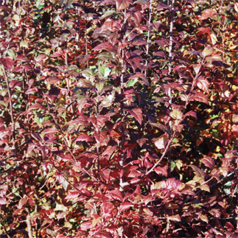 Try in shrub border, edge of forest, shoreline or bank cover. Pinkish white flowers in spring, followed by red berries in fall. This excellent groundcover is highly adaptable, but requires excellent drainage. ECOLOGY: Found in sandy, well drained exposed sites, dry, rocky slopes, dry forest. Produces 2 kinds of fronds: erect (fertile) & spreading (sterile). ECOLOGY: Partial/full shade, likes acid soil. Prefers a cool, moist to wet site. 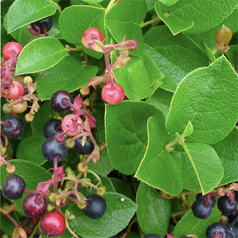 White flowers in early summer, blue-black edible berries in late summer. ECOLOGY: Found in coniferous forests, rocky bluffs on the seashore. Good companion for rhodos, tough bank cover, drought tolerant. 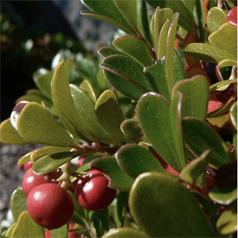 Grayish-green foliage on arching branches, attracts birds. Creamy white flowers in summer. Tough, drought tolerant. Grows almost anywhere. Fragrant yellow flowers in spring, blue black edible berries in summer. ECOLOGY: Dry to moist woodland or open, dry rocky sites. Fragrant yellow flowers in spring, edible blue berries. Ground cover. Use in front of taller mahonias? ECOLOGY: Likes dry to moist soils in a forest environment. Small white flowers in spring, tart red/ yellow crabapples in summer. ECOLOGY: Found in moist woods, swamps, edges of standing or flowing water. Good by streamsides & boggy areas. Fragrant white flowers in early summer. ECOLOGY: Grows in a variety of sites from open, moist forest to open brushy areas on dry, rocky soils. Robust, easily grown, clump forming fern, drought tolerant. ECOLOGY: Partial to full shade, takes some sun. Likes acid soil. well-drained soil. Likes dry conditions in summer. Red to pink flowers in spring, blue black berries in summer. ECOLOGY: Found in dry open woods, rocky slopes, disturbed sites. Fragrant pink to white flowers in late spring, orange to red hips in fall. ECOLOGY: Grows in a variety of habitats from open to woodland, dry to moist. Fragrant, single pink flowers in spring, showy purplish hips in fall. ECOLOGY: Open habitats, shorelines, meadows, roadside, streamside areas. Moist to some drought. White flowers in spring, soft, sweet red berries in early summer. ECOLOGY: Found in clearings, roadways and open forest. Forms dense thickets. Pink flowers in spring, soft, sweet red berries in early summer. ECOLOGY: Grows in moist to wet places, takes shade. Creamy white flowers in spring, showy red berries in summer. Pinkish white flowers in summer, showy white berries persist into winter. ECOLOGY: Grows anywhere – in dry or moist sites. Tolerates drought, poor soils, shade, wind. Pinkish-white flowers in mid spring, delicious black berries in summer. ECOLOGY: Found in coniferous forests, especially edges or openings, on the beach fringe in the salt spray zone. 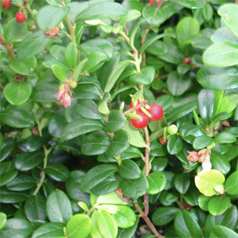 White flowers in spring, edible red berries in summer. ECOLOGY: Found in coniferous forests, bogs, alpine tundra.